When you open up the stock web browser on your webOS phone or TouchPad (including some third-party browsers like Advanced Browser) there is no way to set a home page that should load up at launch. Instead you are presented with either a tile-view of bookmarks or just an empty screen. While there is nothing in the app itself to set a homepage, you can get around this by using the Add Page to Launcher feature (for webOS Phones or the TouchPad) to create a launcher icon that will open up the browser to your preferred homepage. Then just use that icon to launch your browser in the future and ignore the stock app icon. 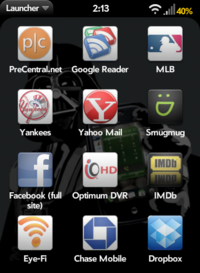 On webOS phones, you can even make that icon look nice using this tip. Unfortunately, the TouchPad does not allow you to do this.